1. Pre heat the oven to 190C/gas 5. Then heat the dark muscovado sugar, golden syrup and butter until melted. Mix the ground ginger, cinnamon and plain flour in a large bowl. Dissolve the bicarbonate of soda in 1 tsp cold water. Make a well in the centre of the dry ingredients, add the melted sugar mix, 1 egg and bicarbonate of soda. Mix well. 2. Cover the surface of the biscuit mix with cling film and leave to cool, then put in the fridge for at 30mins to become firm enough to roll out. 3. Turn the dough out onto a lightly floured surface and knead before thinly rolling out and cutting with heart cutters. Transfer to baking sheets, and make a small hole in the top of each one using a skewer, to thread the hanging ribbon through. 4. Bake for 12-15 mins. 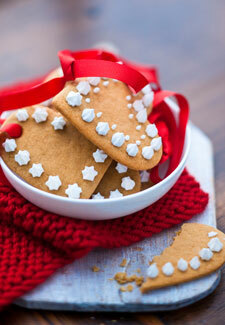 If the holes you have made close up, remake them while the biscuits are warm using a skewer. Finally, break up 100g white chocolate and melt in a bowl over simmering water. Drizzle the chocolate over the biscuits, or pipe.